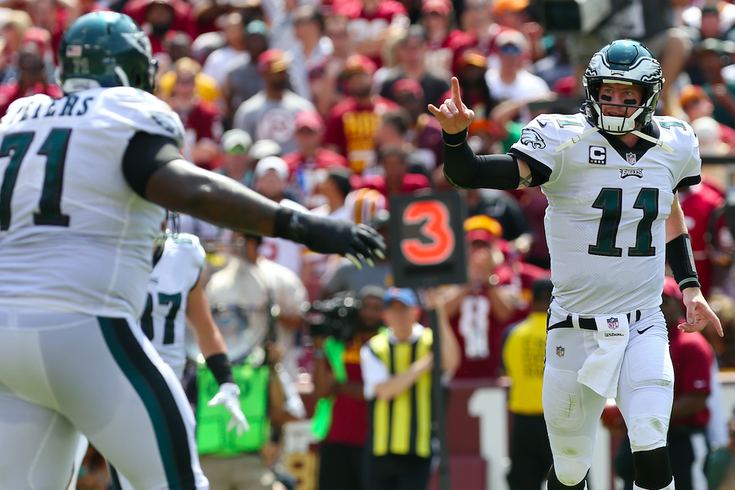 Philadelphia Eagles quarterback Carson Wentz, right, celebrates with Eagles offensive tackle Jason Peters, left, after throwing a touchdown pass against the Washington Redskins. It has been said often enough but still bears repeating: The Philadelphia Eagles won Super Bowl LII despite losing two of their best players, Carson Wentz and Jason Peters, to season-ending knee injuries. Both players are on the mend this offseason as the Eagles face important decisions that will impact them. Peters, 36, is nearing the end of his career but wants to return to the football field. Wentz may or may not be ready for Week 1 in September, so do the Eagles hang on to Nick Foles for insurance? On Thursday, Peters posted an Instagram video of Carson Wentz rehabbing at the gym. Part of his routine is apparently chucking lasers across the gym from a seated position. It's nice to see two important leaders on the Eagles working together to heal from such a difficult injury. The timeline of their returns remain uncertain — and under wraps, as far as the Eagles medical staff is concerned — but Wentz's dedication to rehab and focus on maintaining full-body strength is an encouraging sign.